Steamboat is known as "Ski Town USA" & really does retain the distinctive flavour of the Old West. Steamboat's 6 peaks are filled with world-class groomed cruisers, bumps, steeps, open meadows, legendary trees & Mavericks ­ North America's longest superpipe. The term Champagne Powder was coined in Steamboat and this is the only place you’ll find it! 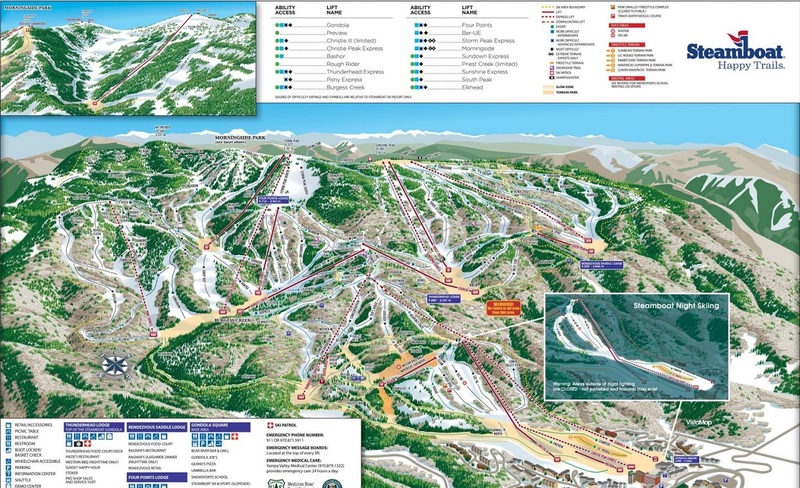 Steamboat ski resort what's new? 2018 / 2019 improvements at the Steamboat base area include a complete makeover of the Timber & Torch main restaurant in Gondola Square, with expanded indoor seating, new outdoor heated patio, indoor & outdoor bars, exterior fireplace & new outdoor BBQ, plus "Taco Beast" food truck, serving trailside in Winter. Steamboat is actually a complete mountain range: Mt. Werner, Sunshine Peak, Storm Peak, Thunderhead Peak, Pioneer Ridge® and Christie Peak with a diversity of trails for all levels of ability. Gladed areas of Pioneer Ridge, Sunshine and Storm Peak are Steamboat's particular claim to fame, with Champagne Powder® snow in the trees for the most avid powder hounds. Steamboat's terrain park, serviced exclusively by its own chairlift features terrain for all ability levels spread over 11.8 acres, an outdoor sound system, professional designed rails and jumps. Mavericks Pipe is a monster of a superpipe: 18-foot walls, 56 feet wide, 22-foot transitions & 500 feet long. Steamboat boasts more than 100 bars & restaurants to take care of even the most discriminating appetite. It's a great place to try local favorites such as elk, buffalo and Rocky Mountain trout. Immerse yourself in western heritage with a Horseback Ride, Snowmobiling, Sleigh Ride Dinners, Hot Springs & Spa Services.